Bojack Horseman is my current favourite series. It could (and should) be yours too. Having finished off Westworld season two, and knowing that the next season of ANYTHING was a year away, I needed something new and exciting to watch during the ‘movie drought’ this summer. Being a fan of adult cartoons such as Rick and Morty, I became aware of a similarly philosophical comedy drama that many claimed was underrated, and even superior to other shows of its kind. I called, and Raphael Bob-Waksberg answered. Netflix’s Bojack Horseman follows a selfish has-been celebrity in LA as he slowly drowns in a tar-pit of his own poor decisions. He also happens to be a humanoid horse-creature in a colourful world of other humanistic animals with equally subtle names. 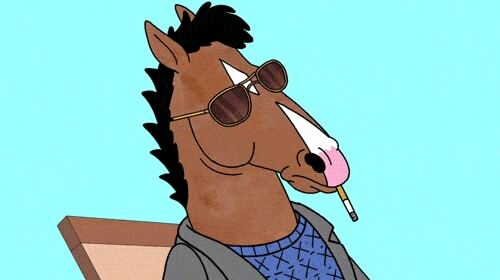 Despite this surreal setting, the show resonated with me more than any other comedy drama, as well as allowing me to relate to an anthropomorphic, beautifully sarcastic horse. I binged seasons 1-4, growing increasingly more invested and engaged. Each episode was less than half an hour, so I sped through them pretty quickly, quickly getting to know the quirky characters and weird world of Bojack’s Hollywood. The main cast are individually quirky and layered, and their depth is explored and developed well throughout the series. Undeniably, Bojack is the most complex of them all. Bojack has extreme issues. The opening sequence shows him drifting aimlessly through his life, cleverly summarising his base character and flaws visually within a minute. It soon becomes clear that he suffers from waves of depression and anxiety, which the show manages to portray in a uniquely authentic and intimate way. His paranoia and loneliness constantly lead him into spirals of self-destruction via alcohol, drugs, or REALLY terrible life choices, and his narcissistic, sarcastic tendencies often forces the viewer to question why the hell they’re still rooting for the guy. Yet, I still do. I feel many of us can relate to Bojack, as a perfect example of flawed human behaviour, or everyman (despite his extreme tendencies). Countless tragic heroes from Shakespeare’s Hamlet to today’s Rick Sanchez have acted as a relatable representative of the audience’s thoughts and views, partly due to their understandable human flaws that the audience can empathise with and emotionally invest in. I see myself in Bojack’s desire to escape responsibilities and difficulties in his life. The right path is often the hardest, and the appeal of short term comfort over long term labour is understood by most, if not all of us. Yet I also see the potential for change. 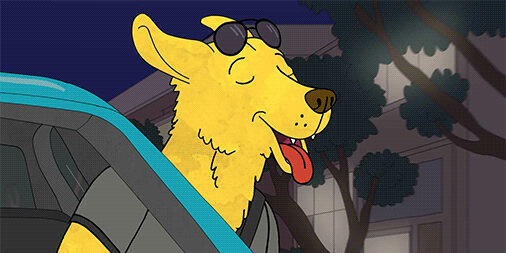 Bojack’s relationships with his friends often act as a lifeline, and a path back to reality in his own chaotic world. Despite his destructive ways, Bojack truly wants to be a good person, which I believe is the first step to his redemption. I’m really looking forward to season 5, and have no doubt that the creators will continue to raise the bar for the comedy-drama genre, and for animation, because I personally think we need more shows like Bojack Horseman. Here’s a few other quick reasons why I love Bojack (and hopefully you will too)! I strongly suggest giving this show a watch. It’ll make you laugh, think, and possibly cry, so why not?